Anderson attended Jesse M. Bethel High School in Vallejo, California, where he played high school football for the Jaguars. He rushed for nearly 4,000 yards during his high school career as he led his team to four consecutive playoff appearances, including a spot in the Sac-Joaquin Section title game as a junior in 2007, when he was named the Vallejo Times-Herald Athlete of the Year. He was a two-time Vallejo Times Herald MVP and first-team selection, while also picking up first-team All-Solano County Athletic Conference honors in both his junior and senior campaigns. He posted 1,297 rushing yards and 20 touchdowns on the ground and completed 44-of-91 passes for 785 yards and 11 scores as a junior. As a senior, he moved to running back after playing quarterback in an option offensive during his junior campaign and rushed for 1,623 yards and 23 touchdowns on the ground, while also contributing with 2 interceptions on defense. He became the first Bethel player to sign with and play for a Pac-12 school. Anderson also participated in track, posting bests of 12.11 seconds in the 100-meter dash and 24.35 seconds in the 200-meter dash. Anderson was selected to the first-team All-American, All-State, and All-NorCal Conference teams while at Laney College in Oakland, California. Anderson went on to play at California after his time at Laney College. Anderson shared the Golden Bears' backfield with Isi Sofele in the 2011 season. As a junior, Anderson had 72 carries for 345 yards and eight rushing touchdowns to go along with seven receptions for 186 receiving yards and one receiving touchdown. As a senior, Anderson continued to share the backfield with Sofele and also shared carries with Brenden Bigelow. He produced 126 carries for 790 rushing yards and four rushing touchdowns to go along with plus 15 receptions for 164 receiving yards and a receiving touchdown. Anderson signed with the Denver Broncos as an undrafted free agent on March 17, 2013. Anderson suffered a MCL injury during practice before the 2013 season started. 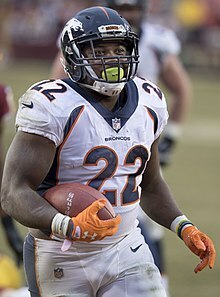 Anderson fought to make the roster with a running back unit that contained Knowshon Moreno, Montee Ball, and Ronnie Hillman. Anderson made his NFL debut on October 27, 2013, running for 22 yards on four carries against the Washington Redskins in the 45–21 victory. Overall, he appeared in five games as a rookie and recorded seven carries for 38 yards. The Broncos reached Super Bowl XLVIII in Anderson's rookie season but lost 43–8 to the Seattle Seahawks. Anderson had a reception for 14 yards and two carries for nine yards as he got the ball for the last three plays of the game. With the departure of Knowshon Moreno to the Miami Dolphins in the offseason, the Broncos backfield provided Anderson with a greater opportunity than the previous season. However, Montee Ball received a majority of the carries early on in the season. In Week 4, against the Arizona Cardinals, Ball suffered a significant groin injury. With his role expanding, on November 9, 2014, Anderson scored his first career touchdown, on a 51-yard screen pass from Peyton Manning in a 41–17 rout of the Oakland Raiders. Anderson also ran for 90 yards on 13 carries. On November 23, 2014, Anderson ran for 167 yards on 27 carries and a touchdown against the Miami Dolphins. Anderson's performance was his first game of his career with over 100 rushing yards. On November 30, 2014, Anderson ran for a season-high 168 yards and a receiving touchdown against the Kansas City Chiefs. Anderson caught a 15-yard touchdown reception. Anderson ran for over 150 yards each time, the first Denver Broncos running back to do so since Reuben Droughns in 2004. On December 7, 2014, Anderson scored three touchdowns against the Buffalo Bills. This was Anderson's first multi-touchdown game of his career. On December 22, 2014, Anderson ran for 83 yards and a touchdown against the Cincinnati Bengals. Against the Bengals, he ran for his fifth touchdown of the season. On December 28, 2014, Anderson ran for another three touchdowns against the Oakland Raiders, bringing his total touchdown total to 10. Overall, in the 2014 season, he finished with 849 rushing yards, eight rushing touchdowns, 324 receiving yards, and three receiving touchdowns. On January 11, 2015, Anderson ran for 80 yards on 18 carries against the Indianapolis Colts in the Divisional Round of the playoffs. The Broncos lost by a score of 13–24. Anderson was ultimately named to his first Pro Bowl at the end of the season in place of the injured Le'Veon Bell. He played for Team Irvin in the 2015 Pro Bowl and had five carries for 16 yards in the 32–28 victory for Team Irvin. Going into the 2015 season, Anderson and Ronnie Hillman were the main running backs for the Broncos. Anderson started off the 2015 season slow without breaking 50 rushing yards in a single game through Week 6. On November 1, 2015, Anderson ran for 101 yards on 14 carries and a touchdown in a 29–10 victory over the Green Bay Packers. Anderson scored on a 28-yard run. On December 2, 2015, after a 30–24 win against the New England Patriots in Week 12, Anderson was named the AFC Offensive Player of the Week. Anderson compiled 113 rushing yards and two touchdowns, including the game-winning score. The Broncos finished the season 12–4 and Anderson had 720 rushing yards with five touchdowns. The Broncos earned the #1-seed in the AFC. On January 17, 2016, Anderson had 15 carries for 72 yards and the game-winning touchdown in the first playoff game, the Divisional Round against the Pittsburgh Steelers. The Broncos won 23–16. In the AFC Championship against the New England Patriots, Anderson had 16 carries for 72 yards. The Broncos won 20–18 to advance to the Super Bowl. On February 7, 2016, Anderson was a key contributor in the Broncos' 24-10 victory over the Carolina Panthers in Super Bowl 50. In the game, Anderson totaled 100 yards of offense on 27 touches (23 carries and four receptions), one of his carries being a two-yard touchdown run with just over three minutes left, expanding the Broncos' lead to twelve points. After the 2015 season, Anderson became a restricted free agent and signed a four-year, $18 million offer sheet with the Miami Dolphins on March 10, 2016. However, on March 15, 2016, the Broncos matched the Dolphins' offer. In the offseason, the Broncos drafted Devontae Booker to compete in the backfield. On September 8, 2016, Anderson ran for 92 yards on 20 carries and two touchdowns (1 rushing, 1 receiving) in the season opening Super Bowl 50 rematch against the Carolina Panthers. Anderson had a 25-yard touchdown reception and a 28-yard run. On September 18, 2016, Anderson ran for 74 yards and a touchdown against the Indianapolis Colts. On October 2, 2016, Anderson ran for his third touchdown of the season against the Tampa Bay Buccaneers. On October 24, 2016, Anderson injured his knee early in the Week 7 game against the Houston Texans but continued to play in the game. Anderson ran for 107 yards on 16 carries and a touchdown. He reported soreness to the team doctors on Tuesday and underwent surgery to repair his meniscus that week. He had 110 carries for 437 yards and four touchdowns along with 16 receptions for 128 yards and a touchdown. He was placed on injured reserve on October 29, 2016 and underwent successful surgery. In the 2017 season, Anderson emerged as the Broncos' main rushing weapon. He ended up being one of the few bright spots for the team in a dismal season. On September 17, 2017, in Week 2, Anderson ran for 118 yards and a touchdown on 25 carries as well as recording three catches for 36 yards and a touchdown against the Dallas Cowboys. He was the first running back to break 100 yards against the Cowboys since Alfred Morris did so for the Washington Redskins in 2015. In Week 15, against the Indianapolis Colts, he finished with 158 rushing yards on Thursday Night Football. On December 31, in Week 17, he rushed for 61 yards on 18 carries against the Kansas City Chiefs, bringing his season yardage total to 1,007 yards. It was his first 1,000-yard season. On April 16, 2018, Anderson was released by the Broncos after five seasons. On May 7, 2018, Anderson signed a one-year contract with the Carolina Panthers. He joined a backfield already dominated by Christian McCaffrey. He made his Panthers' debut in their season-opening 16–8 victory over the Dallas Cowboys. He had seven carries for 35 yards in the win. In Week 3, he scored his first touchdown as a Panther on a 24-yard reception against the Cincinnati Bengals. On November 12, 2018, Anderson was released by the Panthers. On December 5, 2018, Anderson was signed by the Oakland Raiders. On December 11, 2018, he was waived by the Raiders without seeing any game action. On December 18, 2018, Anderson was signed by the Los Angeles Rams. With Todd Gurley inactive, Anderson had a great game in Week 16 against the Arizona Cardinals, rushing for 167 yards and a touchdown as the Rams won 31-9. He followed this with 132 rushing yards, 22 receiving yards, and a rushing touchdown in a 48-32 win against the San Francisco 49ers. Anderson finished the 2018 season playing 11 games (nine with the Panthers, two with the Rams), recording 403 yards and two rushing touchdowns on 67 carries, and five catches for 41 yards and a receiving touchdown. In the NFC Divisional Round, Anderson ran 23 times for 123 yards and scored two touchdowns to lead the Rams to a 30-22 victory against the Dallas Cowboys. In the NFC Championship Game against the New Orleans Saints, Anderson led the team in rushing with 16 carries for 44 yards and caught a five-yard pass in a 26-23 overtime victory to advance to Super Bowl LIII. In the Super Bowl, Anderson had seven carries for 22 rushing yards and two receptions for 12 receiving yards, but the Rams lost 3-13 to the New England Patriots. On April 1, 2019, Anderson signed with the Detroit Lions. Anderson is a longtime fan of the Sonic The Hedgehog video game series. ^ "C.J. Anderson, Jesse M. Bethel , Running Back". 247Sports. Retrieved February 3, 2019. ^ "NFL Dreams For T.J. Ward, C.J. Anderson Began In The Bay Area". CBS Denver. February 1, 2016. Retrieved February 3, 2018. ^ a b "California Golden Bears Profile". calbears.com. ^ "C.J. Anderson | California | Broncos RB". www.trackingfootball.com. Retrieved November 5, 2016. ^ "Laney College C.J. Anderson Archives". Peralta Colleges. Retrieved February 3, 2019. ^ "C.J. Anderson Talks About What He Learned At Laney College". NESN. Retrieved February 3, 2019. ^ "Broncos' C.J. Anderson credits Bay Area for NFL success - SFChronicle.com". www.sfchronicle.com. February 6, 2016. Retrieved February 3, 2019. ^ "C.J. Anderson College Stats". College Football at Sports-Reference.com. Retrieved February 3, 2018. ^ "2011 California Golden Bears Stats". College Football at Sports-Reference.com. Retrieved February 3, 2019. ^ "C.J. Anderson 2011 Game Log". College Football at Sports-Reference.com. Retrieved February 3, 2018. ^ "2012 California Golden Bears Stats". College Football at Sports-Reference.com. Retrieved February 3, 2019. ^ "C.J. Anderson 2012 Game Log". College Football at Sports-Reference.com. Retrieved February 3, 2018. ^ Klis, Mike (March 17, 2013). "Lerentee McCray, C.J. Anderson are undrafted Broncos bonus babies". First-and-Orange. Retrieved November 5, 2016. ^ Mike, Bronco (August 15, 2013). "CJ Anderson sprained MCL, out 4-6 weeks". Mile High Report. Retrieved November 3, 2016. ^ "2013 Denver Broncos Statistics & Players". Pro-Football-Reference.com. Retrieved February 3, 2019. ^ "Washington Redskins at Denver Broncos - October 27th, 2013". Pro-Football-Reference.com. Retrieved February 3, 2019. ^ "C.J. Anderson 2013 Game Log". Pro-Football-Reference.com. Retrieved February 3, 2019. ^ "Seattle Seahawks beat Denver Broncos, 43-8, to win Super Bowl XLVIII". Fox News. February 3, 2014. Retrieved November 3, 2016. ^ "Super Bowl XLVIII - Seattle Seahawks vs. Denver Broncos - February 2nd, 2014". Pro-Football-Reference.com. Retrieved August 7, 2017. ^ "Free agent RB Knowshon Moreno to visit Dolphins". USA TODAY. Retrieved February 3, 2019. ^ "Broncos RB Montee Ball will be out for 'a while'". SI.com. Retrieved February 3, 2019. ^ "Anderson's 51-yard catch-and-run TD". Retrieved November 5, 2016. ^ Montgomery, Kyle (November 9, 2014). "Manning, Anderson rout Raiders 41-17". Mile High Report. Retrieved November 5, 2016. ^ Mason, Andrew (November 23, 2014). "C.J. Anderson's 'hot hand' sizzles in Broncos' comeback win". Retrieved November 5, 2016. ^ Wesseling, Chris (November 30, 2014). "C.J. Anderson, Broncos run to big road win over Chiefs". NFL.com. Retrieved November 5, 2016. ^ "Denver Broncos running back C.J. Anderson 15-yard touchdown reception". NFL.com. Retrieved November 5, 2016. ^ "Reuben Droughns 2004 Game Log". Pro-Football-Reference.com. Retrieved February 3, 2019. ^ Fahey, Cian. "Anderson Developing into Elite RB". Bleacher Report. Retrieved November 5, 2016. ^ Klis, Mike (December 23, 2014). "C.J. Anderson apologizes for Bengals postgame interview". First-and-Orange. Retrieved November 5, 2016. ^ Renck, Troy (December 28, 2014). "Raiders vs. Broncos: Highs, lows of Denver's Week 17 win". First-and-Orange. Retrieved November 5, 2016. ^ "C.J. Anderson 2014 Game Log". Pro-Football-Reference.com. Retrieved February 3, 2018. ^ "Broncos lose playoff to Colts 24-13; Coach Fox leaves Broncos on Monday". Hill'n Holler. January 12, 2015. Retrieved November 5, 2016. ^ "Divisional Round - Indianapolis Colts at Denver Broncos - January 11th, 2015". Pro-Football-Reference.com. Retrieved February 3, 2018. ^ Patra, Kevin (January 12, 2015). "Davis: Colts used Seahawks 'blueprint' to beat Broncos". NFL.com. Retrieved November 5, 2016. ^ "Anderson named to 2015 Pro Bowl". January 19, 2015. Retrieved November 5, 2016. ^ "2015 Pro Bowl Summary" (PDF). NFL.com. ^ "2015 Denver Broncos Statistics & Players". Pro-Football-Reference.com. Retrieved February 3, 2019. ^ Lynch, Tim (November 1, 2015). "Second Quarter: Anderson put Broncos up 24-10". Mile High Report. Retrieved November 5, 2016. ^ "Broncos C.J. Anderson takes off for a 28-yard TD". NFL.com. Retrieved November 5, 2016. ^ a b Lattimore-Volkmann, Laurie (December 2, 2015). "C.J. Anderson wins Offensive Player of the Week". Mile High Report. Retrieved November 5, 2016. ^ "2015 Denver Broncos Statistics & Players". Pro-Football-Reference.com. Retrieved February 3, 2018. ^ "C.J. Anderson 2015 Game Log". Pro-Football-Reference.com. Retrieved February 3, 2018. ^ "2015 NFL Standings & Team Stats". Pro-Football-Reference.com. Retrieved February 3, 2018. ^ Pomponio, Ken (January 17, 2016). "10 telling numbers after the Broncos' playoff victory over the Steelers". bsndenver.com. Retrieved November 5, 2016. ^ Carney, Josh (January 17, 2016). "Steelers Lose To Broncos 23-16 In AFC Divisional Round". Steelers Depot. Retrieved November 5, 2016. ^ Renck, Troy (January 24, 2016). "Broncos hold off Tom Brady and Patriots, head to Super Bowl". The Denver Post. Retrieved November 5, 2016. ^ Wesseling, Chris (January 24, 2016). "Broncos smother Patriots, advance to Super Bowl 50". NFL.com. Retrieved November 5, 2016. ^ Stites, Adam (February 7, 2016). "Broncos win Super Bowl thanks to elite defense". SBNation.com. Retrieved November 5, 2016. ^ Boilard, Kevin. "Three players who filled up the box score in Super Bowl 50". FOX Sports. Retrieved November 5, 2016. ^ "Broncos C. J. Anderson runs up the middle for 2-yard TD". NFL.com. Retrieved November 5, 2016. ^ Brinson, Will (March 10, 2016). "Dolphins sign RB C.J. Anderson to four-year, $18 million offer sheet". CBS Sports. Retrieved March 15, 2016. ^ Legwold, Jeff (March 15, 2016). "Broncos match Dolphins' offer sheet to C.J. Anderson". ESPN.com. Retrieved March 15, 2016. ^ Clair, Ian St (September 8, 2016). "C.J. Anderson and the Broncos offensive line shines in win over Carolina". Mile High Report. Retrieved November 5, 2016. ^ "C.J. Anderson bounces outside for 28 yards". NFL.com. Retrieved November 5, 2016. ^ Light, Casey (September 18, 2016). "C.J. Anderson logs another workmanlike performance in Week 2 win". Mile High Sports. Retrieved November 5, 2016. ^ "C.J. Anderson rushes past Bucs on 1-yard TD". Retrieved November 5, 2016. ^ Clair, Ian St (October 24, 2016). "Broncos' one-two punch of C.J. Anderson and Devontae Booker lead to big win". Mile High Report. Retrieved November 5, 2016. ^ Klis, Mike (October 27, 2016). "Broncos RB C.J. Anderson to have meniscus surgery; return unclear". USA TODAY. Retrieved November 5, 2016. ^ "C.J. Anderson 2016 Game Log". Pro-Football-Reference.com. Retrieved February 3, 2018. ^ DiLalla, Aric (October 29, 2016). "Broncos move C.J. Anderson to IR, promote Juwan Thompson to active roster". DenverBroncos.com. ^ Kelberman, Zack (November 4, 2016). "Surgeon makes shocking discovery about C.J. Anderson". Denver Broncos. Retrieved November 5, 2016. ^ "2017 Denver Broncos Statistics & Players". Pro-Football-Reference.com. Retrieved February 3, 2019. ^ "Dallas Cowboys at Denver Broncos - September 17th, 2017". Pro-Football-Reference.com. Retrieved February 3, 2018. ^ Strickler, Colton (September 17, 2017). "Through two games, C.J. Anderson has been the workhorse the Broncos need | Mile High Sports". milehighsports.com. Retrieved September 18, 2017. ^ "Denver Broncos at Indianapolis Colts - December 14th, 2017". Pro-Football-Reference.com. Retrieved February 3, 2018. ^ "Kansas City Chiefs at Denver Broncos - December 31st, 2017". Pro-Football-Reference.com. Retrieved February 3, 2018. ^ "C.J. Anderson 2017 Game Log". Pro-Football-Reference.com. Retrieved February 3, 2018. ^ Patra, Kevin (April 16, 2018). "Broncos releasing RB C.J. Anderson after five seasons". NFL.com. ^ Henson, Max (May 7, 2018). "Panthers sign C.J. Anderson to one-year contract". Panthers.com. ^ "2018 Carolina Panthers Statistics & Players". Pro-Football-Reference.com. Retrieved February 3, 2019. ^ "Panthers' C.J. Anderson: Decent in complementary role". CBSSports.com. Retrieved October 1, 2018. ^ "Carolina Panthers hand Cincinnati Bengals first loss". WCPO. September 24, 2018. Retrieved October 9, 2018. ^ Henson, Max (November 12, 2018). "Panthers waive C.J. Anderson". Panthers.com. ^ "Raiders announce transactions - 12.5.18". Raiders.com. December 5, 2018. ^ "Raiders announce transactions - 12.11.18". Raiders.com. December 11, 2018. ^ Simmons, Myles (December 18, 2018). "Rams Sign Veteran RB CJ Anderson". TheRams.com. ^ "Anderson runs for 167 yards, Rams beat Arizona 31-9". USA TODAY. Retrieved February 3, 2019. ^ "Bethel grad Anderson runs for 132 yards in Rams' win over 49ers". Times-Herald. December 31, 2018. Retrieved February 3, 2019. ^ "C.J. Anderson 2018 Game Log". Pro-Football-Reference.com. Retrieved February 3, 2019. ^ "Divisional Round - Dallas Cowboys at Los Angeles Rams - January 12th, 2019". Pro-Football-Reference.com. Retrieved February 3, 2019. ^ "NFC Championship - Los Angeles Rams at New Orleans Saints - January 20th, 2019". Pro-Football-Reference.com. Retrieved February 3, 2019. ^ "Super Bowl LIII - Los Angeles Rams vs. New England Patriots - February 3rd, 2019". Pro-Football-Reference.com. Retrieved February 9, 2019. ^ Jackson, Lakisha (April 1, 2019). "Lions signing RB C.J. Anderson to one-year deal". NFL.com. ^ Kelberman, Zack (September 18, 2016). "LOOK: C.J. Anderson brings Sonic the Hedgehog to live interview". CBS Sports. Retrieved December 24, 2018.